Though it will in no way compare to the ongoing flooding problems in other regions of our continent, we’ll likely be hearing about our own sogginess at some flood-prone parts of the region from now through Thursday. Any flooding that occurs tonight will be a result of the merging of spring high tides with a minor storm surge blown in by moderately strong east winds. Unfortunately, mother nature will throw one more factor into the mess tomorrow, with two days of potentially heavy rainfall that could bring even more flooding. Below are astronomical tide predictions (blue) and total water level predictions (pink) relative to normal low tides (MLLW), from the Storm Surge Warning System (SSWS) for the water levels for today as well as the next two days. 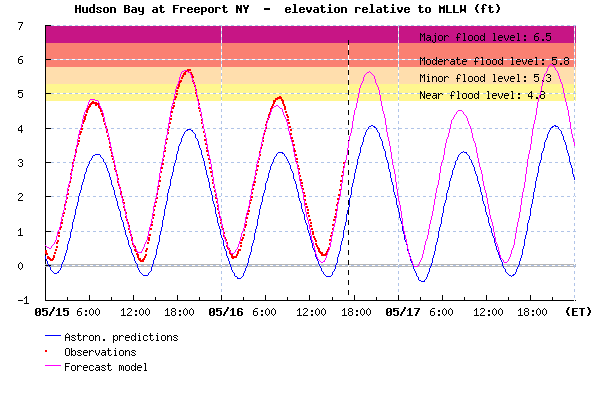 This evening’s spring high tide may be pushed high enough by winds for some minor flooding at coastal locations (all the places around NYC where there is seawater are “coastal”, including the Hudson). Tomorrow evening is spring tide, plus the winds are projected to be stronger, so it should be worse. Check the SSWS website out near high tide this evening or Tuesday evening or Wednesday evening, to see if any orange and red lights pop up to mark flooding water levels. 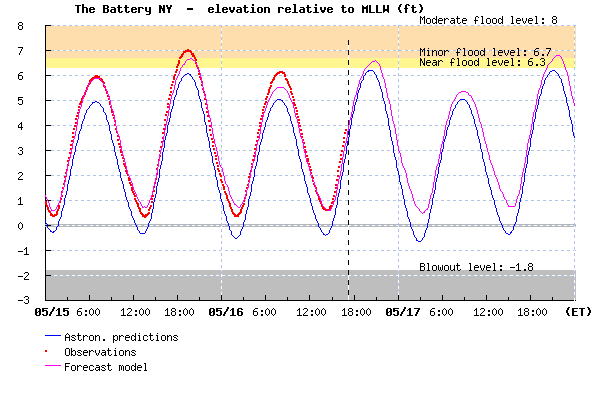 Using computer models to predict flooding can get boring, so I am planning to visit The Battery at 8pm (high tide) to see for myself what the “minor flooding level” means on the ground beneath my own feet. The last time there was minor coastal flooding, I got rain-drenched but managed to observe that water levels were about a 1.5 feet away from flooding over the seawall onto East River Drive (FDR) at 96th Street. It’s pretty alarming to see the ocean rise up to within a foot of flooding over the wall and into our city, and I recommend checking it out before the rains set in tomorrow. One of the worst areas in the region for flooding when there are east or northeast winds is Freeport, Nassau County, presumably due to the fact that waters get blown there from the western end of South Oyster Bay (correct me if you know better) and through the nearby channel out to the Atlantic. Here’s the SSWS forecast for that location. This entry was posted in water, weather and tagged flooding, Freeport, Manhattan, New York City, rain, South Oyster Bay, spring tide, storm surge, The Battery. Bookmark the permalink.